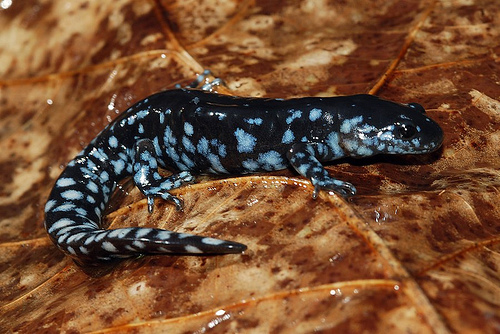 The Blue Spotted salamander, beautiful name isn’t it? This is exactly how we can define the cutest member of the salamander family. This species is quite old and has been successful in adapting to the human impacts on the environment. Its slimy and sleek body structure assists its movement and which is why is easily found at the neighbourhood parks or somewhere sliding in the dark store rooms. 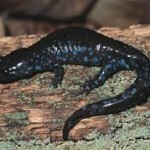 We highlight quite a few interesting facts about this intriguing blue spotted salamander below. We take a quick tour of a few interesting facts about these species. The male counterparts are relatively smaller in size when compared to the females. They feel quite at home despite human habitation around them. They attain the mating age at as young as two years. The spotted salamander is majorly found in the United States and Canada especially around the Great Lakes. Apart from this they are also found in parts way away from North America, near New Jersey, parts of Indiana, regions of Lowe and New England. Size – Generally ranging between 8 to 10 centimetres in length, this species of amphibians have a peculiarly large sized tail. 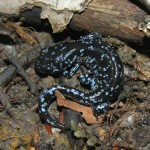 More often than not, the tails Blue spotted salamanders expand for about 8 – 14 cm in length. Their tails comprise of almost 40% of their body size. Colour – The blue, as they are named, is of a very dark tone and the sides of their body are spotted by the lighter toned bluish spots that continue right up to the tail. The ark bluish black colour of the body is complemented by a pale coloured stomach that faces downwards. Frame – Their stomachs are rather oval shaped with slimy tails that gives their body an elongated look. Peculiar feature found in male bodies is their tails that are rather flatter and longer than that of the females. 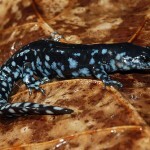 Limbs – Like most other amphibians, the blue spotted salamander is also gifted with 2 pairs of limbs located in the front and the hind side of their body. The toes are however, unequal. They have 4 on the frontal part of the body and 5 toes at the hinds. These species prefer to dwell in wet damp areas, deciduous forests, swampy woodlands and hardwood forests. While mating, they generally move into ponds and such small water bodies and come out only after summer. They can also be found living on logs of wood, leaf litters, or under some bushy area. The Blue spotted salamander is carnivore specie and prefers to feed on snails, earthworms, slugs, spiders, centipedes and other such invertebrate likes. These salamanders prefer isolation and tend to be very secretive in nature. They are active mostly during the evenings and night time. These carnivorous creatures protect themselves by secretion of toxins over the enemy’s body. 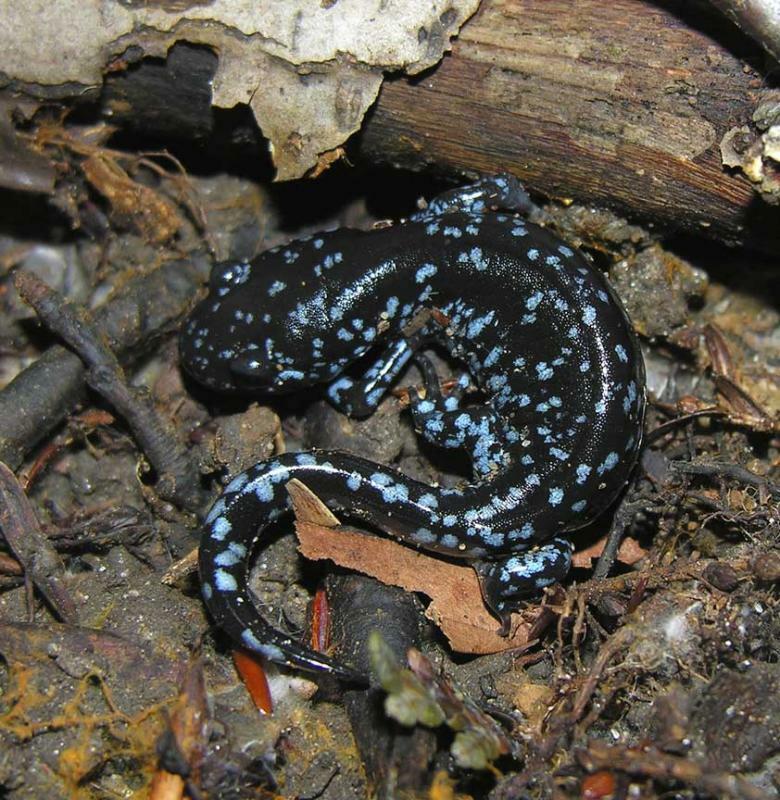 These blue spotted salamanders prefer to mate during late winter or spring. These creatures of the salamander family start mating as early as 2 years. They usually choose an isolated pond or water body for their ideal mating location. The male counterpart tries to attract the female for mating by rubbing his chin against the female’s body and then brings her closer with the help of its fore limbs. He then leaves behind germ cells somewhere under the pond for the female to assimilate them in her body. These germ cells germinate into eggs once they are inside the body of the female. The female counterparts lay their eggs under rocks or hidden in some aquatic plant that stay rooted to a spot for their safety. A female can lay near about 490 eggs in a single year. The eggs generally take about a month to hatch. The eggs that have been laid by the females hatch after a month into a larva that possesses both, an active mouth and eyes. It is only after a fortnight more, that the forelimbs start appearing and about three weeks from the larva stage, they gain the hind ones. The larva stage transforms into the complete salamander only after late summer. In order to protect itself from the predator the salamander has unique adaptive features. They initially start retaliation by lashing their tails in continuous motion. It then spins itself within the tail and releases a toxin aiming for the predator’s mouth whenever the marauder tries to catch hold of it. If the predator turns out to be immune from the toxin, the salamander releases itself from its grasp by releasing its tail. The tail regrows with time. The common predators of the salamander include fishes, raccoons, birds, snakes, dogs, and aquatic animals. The caring of these salamanders is the same as that of the black salamander. Refer to the article on the black salamander for caring guide. 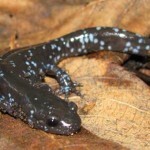 The salamanders have different life spans in wild and captivity. They live for 12 years in former state and for about 32 years in the latter. 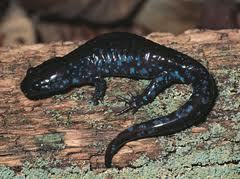 The Blue Spotted Salamander is among the least endangered of the salamander species as per the report by IUCN.